For anyone who takes notice of my FB page, you might remember I mentioned about sharing some deleted scenes from Blue Moon. Well, I decided to listen and let you have them. I’m giving you one (which is actually two). Before I do, let me reassure you that you don’t have worry. These aren’t scenes that would show a different outcome to that which you’ve read in the published version of the book. They are simply scenes that are now hinted at having happened because we removed them to move the story along faster (for good reason–heh). Oh, and sorry to any hopefuls, but these aren’t ‘intimate’ scenes. p.s. these have not been professionally edited. ‘Big’ didn’t even begin to describe the store; gigantic would have been far more fitting. In my younger years, kids were lucky if they had one of those pathetic electronic ping-pongy-tennis games for the TV. The toy store had so many consoles, it made my head hurt. Sean’s six foot three height allowed his chin to rest atop my five-seven frame. With his arms folded around my chest, his breaths warming my neck, his body heat sifting through my clothing, we hobbled our way through the mass of toys. “What does Ben like?” asked Sean. As soon as we rounded the corner to the boys aisle, Sean’s arms released me. I peered at him over my shoulder, smothered a laugh at the shine in his eyes as he picked up one box, and then another. He went the whole length of the shelves, studied the action figures, the miniaturised racing tracks and scale-sized cars to accompany them, the train sets, too. When he stuck a pointed hat on his head and waved a wand about, my laugh snorted out. I stared at him. Had he intended it to sound as it did? He spotted my expression, put the bricks back with a frown, and disappeared round the corner. I turned to scour the figures. Gaze falling on an unusual set, I picked them up for a closer look, hummed and harred over which to get. At Sean’s chuckle I looked back to see him whizzing back round the corner on a skateboard. He almost knocked me over with his outstretched arms, as he brought his newfound wheels to a halt. “You’ll get us kicked out,” I said with a giggle. He stepped from the skateboard, took the box from me. His gaze went from the one in his hand, to the others on the shelf, before he burst out laughing. I’d found a range of werewolf action figures. The bistro Sean chose for lunch held few patrons. Cosy summed up the dimmed lighting, the dark-wood panelled walls, the yellowed black and white framed photographs that adorned the generous lounge. The offered seats in an enclosed corner of the room added a romantic element to it all. He smiled before turning as the waitress sidled up with pad and pen in hand. Sean ordered an orange juice and lemonade, a rare sirloin. The woman wrote it all down and looked to me. “Potatoes and stuff?” Sean chuckled when we were alone. I never complained about Nathan’s concerns about me going out alone—or Sean’s. They weren’t unfounded. Sean and I never questioned Nathan’s worries over the two of us being out together either. As the first female werewolf, bitten by Sean two centuries before, bound to be reunited by a spell my mother placed on us at the time, I—we—tended to be well known, thanks to werewolf history. If another pack saw us, figured out who we were, past experience told us their curiosity alone could bring trouble—though, I didn’t quite understand their fascination with me. Thankfully, since eliminating the pack who hoped to keep me for themselves back in August, we hadn’t come into contact with any other outside wolves. We remained quiet for a while. Constant conversation had never been a requirement for our relationship. The waitress didn’t even speak when she brought our drinks—probably thought we were making gooey eyes at each other … which, I guessed, we were. At the arrival of our food, we broke focus only long enough to be polite before our eyes reconnected. We watched each other a lot. I liked to watch him eat. The pronouncement of tendons in his arms with each stab of the fork, every slice of the knife. The way he studied each individual item on his plate as though what he ate next was the most important decision in the world. The satisfaction on his face as the flavours pleasured him. I imagined he got the same enjoyment from watching me, because he always did it, too. He reached over, speared a chunk of broccoli with his fork. It disappeared into his mouth before he attacked his chips. After ramming in enough to render him incapable of speech, he stabbed some more, stretched over to feed them to me. He shrugged then smiled when I offered him my last potato. Happy Book Birthday, Resonance! Time for a Giveaway! However, because I love and appreciate my fans so much, I decided to go on a mission to give something back. Thanks to my super-duper editor, I’ve been granted permission for the following. I vow to give away a FREE copy of Resonance to everyone who submits a valid entry between April 2nd and May 2nd (inclusive). On top of that, one main-prize winner will receive a Holloway Pack swag-bundle (see below). Resonance is, by no means, intended to be read as a standalone. If you haven’t read at least Blue Moon, then you will have absolutely no idea what is happening in Resonance. Also, if you haven’t read Blue Moon, then you will be hit upside the head with one massive spoiler for how the book ends if you read Resonance first. Post a picture of you with your precious copy or Blue Moon somewhere on the Internet (yes, you do have permission to hide all but your eyes behind it if you just so happen to be camera shy). It does not have to be a hard copy (paperback); it can be the cover image on the screen of your Kindle/e-reader/reading tablet. No, pdf’s do not count. If you have a pdf, then it’s most probably an illegal copy, and so will only upset me. Once said picture is posted, link me up so I can see it. If you stick it on FB, then tag me, but remember, I have a space (for some bizarre reason) between my initials on there. So, make sure you use @J. A. Belfield in your tag. NB: There will be a space in the Rafflecopter form to paste in a link to your pic, also, just in case I miss any or the tagging doesn’t work. If you stick it on Twitter, then be sure to mention: @JABelfield so I can see your entry. And if you happen to stick it anywhere else, then be sure to forward a link to the post to j.a.belfield72 at gmail.com and include ‘The Big Resonance Giveaway’ in the subject line. Post a review for Blue Moon. Obviously, I’d prefer amazing ones, but I get that my writing won’t jive for everyone, so any review over 100 words will be accepted, even if it doesn’t rave and include 4/5 stars. However, I will read each review carefully (because I always do), and ascertain that I believe the book has actually been read rather than a review being composed out of a rewrite of the blurb (yes, this does happen on occasion). Where you post your review is up to you. On Goodreads. Amazon. B&N. On your blog. Completely up to you. But the Rafflecopter form will have separate entry options for each of these places, and each one will be included as an entry toward the main prize. Off you go, go, goooo! And don’t forget to follow along on the tour, for more posts and Holloway Pack fun. Full schedule can be found HERE! So, I just found out something in the last couple of days about Resonance, which is due to release on Tuesday–April 2nd–next week. Rather than bore you with my waffle, I figured I’d give you a hint with an image instead. Please excuse the quality of the image–I did a screen shot for ease–but the most important point is …. RESONANCE IS GOING TO BE AVAILABLE IN PRINT!!!!! In case you’re wondering, this IS a big deal to me, because Resonance will be the first of my novellas to be available in this format. So, for all of you who have a mass preference for real-life books that have sniffable and strokeable appeal, fear not. You’ll very soon be able to go through your book greeting ritual with Resonance, too. I LURVES when I get the opportunity to give away an ARC to one of my followers. LOVE that I get to give it to one of you guys. And the day has arrived to do exactly that! 1)If you try and read Resonance without having first read Blue Moon, you are going to be LOST! There is very, very little backstory in Resonance. It pretty much jumps straight in from where Blue Moon left off. So if you try skipping Blue Moon to read this? You’re gonna have trouble following this latest addition. 2) Also, if you do read Resonance without having first read Blue Moon, then you’re heading into spoiler zone as far as Blue Moon is concerned. You’ll know some of what’s happened in Blue Moon, but without having it fully explained so it will lack clarity. The ending of Blue Moon will also be wrecked for you because it’s pretty clear from Resonance where Blue Moon left off. Make sense? So I’m strongly advising folk not to read Resonance before Blue Moon for those two reasons. The whole point of eARC distribution is to generate reviews, which leads to recognition, which leads to further interest, which leads to more reviews …. you get the picture. 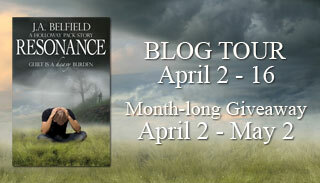 So, in return for the review copy, I’d love for you to leave a review of Resonance if you win. It can be on Goodreads or on your blog, or anywhere else that takes your fancy. But I loves me reviews, so please leave one. So now all’s you gotta do is head across to the Rafflecopter Form HERE!, where there are options for more ways to enter to increase your chances. Giveaway will remain open until Wednesday January 30th. Now, I know you’re all chomping at the bit for a sighting of Caged’s cover, just so you can get a glimpse of what might be in store for Ethan, but how about a sneaky peek at Resonance’s opening whilst you’re waiting? Yep, the time has arrived to give you a taste of what’s in store for the guys post Blue Moon. Warning: contains spoilers if you haven’t read past Darkness & Light (or Marked: Into the Unknown). Whiteness reflected back at me from the ceiling above—a blank canvas of nothingness. For two weeks, I’d spent a few hours each day in the lilac bedroom. For two weeks, I’d prayed for a miracle. For some kind of enlightenment. Or at the very least, for Jess to find a way to wake up Josh. Some days, the emptiness dulled my senses to a warble of incoherency. Thankfully, on those days, Sean came to my rescue, reminding me life still existed beyond the four, pale purple walls. Somehow managing to convince me that everything would work out. If Sean believed Josh would awaken, what right did I have to dispute him? If the rest of the pack believed, who was I to douse their flames of hope? Yet, no matter how many hours, how many days, how many weeks I spent at Josh’s side in a show of optimism, the ache in my heart belied any positivity I feigned. Rolling onto my side caused the mattress to dip, but even that jostle didn’t stir Josh. I flicked at an errant, dark blond curl, poked at his cheek. Still, he didn’t move, didn’t flinch, didn’t acknowledge my prodding. Poor kid had probably been poked more in the past fortnight than he had his entire life. As my heavy sigh eased out, footsteps ascended the stairs outside the room. I knew from sound alone who they belonged to, didn’t even need to inhale to confirm. That didn’t stop me, though, and my lids lowered as my mate’s bouquet found home within my olfactory. “Hey,” I whispered without looking up. I tapped my fingertip along Josh’s jawline, willing him to react yet knowing he wouldn’t. Josh hadn’t moved the entire two weeks he’d been under. Heck, we’d barely moved him. No toileting. No sweating. He didn’t seem to feel, hear, taste, see or smell. All thanks to being in a death sleep, Jess had said. I slaughtered the witches responsible for putting Josh under—for bewitching him in the worst possible way. At the time, their deaths had seemed fitting. That had been before I realised Josh’s predicament. My gaze skittered to the left and landed on Sean’s lopsided smile. Dark hair stood on end above dark eyes staring back at me. All male, all muscle, all mine, Sean Holloway got me like no other. Rolling my eyes at the suggestiveness of his tone, I brushed a kiss across Josh’s cheek and wriggled off the bed. At the door, I grabbed Sean’s hips and steered him backward across the landing and into our room.